Today, one month later, I'm returning to blood oranges and find that the same opening sentence will work again, just by changing the month. It's March, and the weather is pretty miserable. There are cold fronts, snow storms, dense fog, and freezing rain blanketing various parts of the country. See what I mean? Works just fine. This might also explain why I have seen so many blog posts lately about SAD (seasonal affect disorder) and creative dry spells and general feelings of ickiness. People are craving sunshine and balmy breezes and spring blossoms. While I can't make the daffodils grow any more quickly, I can share a recipe for a refreshing Italian Almond and Orange with Blood Orange Compote that is sure to make you feel warm and happy. I created the recipe a few weeks ago and have since made it two more times. It's that good. While this Italian torte bakes, your home will be filled with the bright scent of citrus. Since it's subtly sweet yet rich with almond flavor, it's ideal for pairing with a glass of Italian Vin Santo on a relaxing afternoon. It also makes a lovely formal dessert when dressed with a spicy compote of tart blood oranges soaked in honey, vanilla, cloves, and star anise. Given that this is an Italian torte with Sicilian blood oranges (OK, they're San Diego blood oranges, but they're descendants of Sicilian ones), I'm sharing it with Maryann of Finding La Dolce Vita and Marie of Proud Italian Cook who are hosting their second annual Festa Italiana. So enough about the torte. Let's mangia! Position a rack in the center of the oven and preheat to 350 degrees F. Butter then flour an 8-inch round cake pan. In a food processor, grind almonds until a fine meal forms (it's okay if there are a few bigger pieces; it adds to the texture). In a small bowl, sift together flour, baking powder, and salt. Add the ground almonds. In a medium bowl, using an electric mixer set on high, beat butter and sugar until light. Beat in the eggs. Add almond extract, orange zest, and orange juice; beat until batter is fluffy. Add the flour mixture to the egg mixture; reduce speed and beat until just combined. Pour batter into the prepared pan. Bake for 35-45 minutes, or until the top is golden brown. When you insert a toothpick or cake tester into the middle it may come out slightly moist with little bits of cake clinging to it. That's OK. This is a super moist, dense cake. If, however, it is wet or jiggly, then it needs to be baked longer. Transfer the cake to a rack and let cool for 10 minutes. Invert cake onto the rack, then turn right side up. Meanwhile prepare the blood orange compote. In a medium pot over high heat, combine water, honey and sugar; bring to a boil. Reduce heat to low, and add lemon juice, vanilla, star anise and cloves. Simmer, partially covered, for 20 minutes, or until a syrup forms. Add oranges and simmer 5 minutes more. Note: The longer you simmer the oranges, the softer they will become. For firm orange slices, simmer no longer than 5 minutes; for softer slices, simmer up to 10 minutes. Any longer than tha, and the oranges will begin to break down. They will stay taste good, but their appearance won't be as attractive.) Serve slightly warm or at room temperature. Remove the star anise and cloves before serving. Serve cake warm or at room temperature. Top each slice with a spoonful of blood oranges and drizzle with the syrup. If desired, garnish with orange zest curls and star anise; just make sure to remind your guests that the star anise are inedible! Note: The cake can be made 1-2 days ahead and left on the counter top. However, it's best to make the oranges just prior to serving. For more on the history and culinary uses of blood oranges, check out my NPR article: "Blood Oranges: Change You Can Believe In." that does sound like an amazingly perfect pairing for vin santo! the compote is gorgeous and sounds delicious! this post is making me long for spring!! Haha, you caught me. I have totally made reference to SAD and this gloomy weather. I can't tell you how much I appreciate your effort to bring spring and sunshine to the blogging community. This Almond and Orange Torte seems like the perfect segue into spring; I'm sure this cake alone could make the day sunnier and warmer! SAD is bad in my region since we don't have much sunshine in the winter. This would surely beat all the winters blues. Looks scrumpious. A stunning combination! This Torte looks fantastic! oh yes! 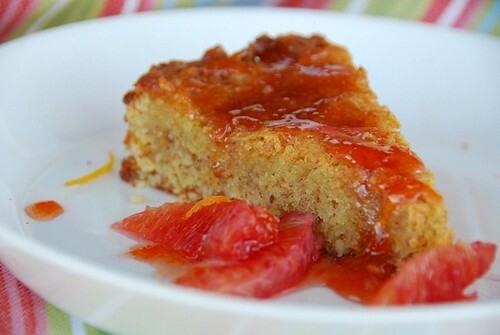 this is really and excellent torte - i love such simple cakes jazzed up with citrus fruit. great one! Looks so yummydelicious, i am bookmarking these . Catch you at the fest Food Blogga...you better save a slica for me! That looks so fresh & exciting Susan...I just love it!! BTW, the first picture has an instant uplifting energy in it! 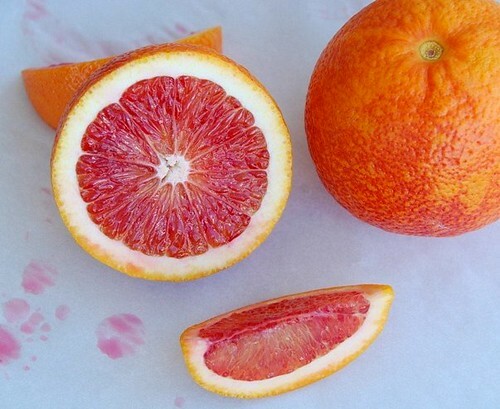 I remembered your past blood orange post as soon as I saw this post's photo and header. :-) This recipe looks awesome and one I'll be able to tweak to be gluten-free without any trouble. I love those kinds of recipes! Yes, we all have our own version of the blues lately for a variety of reasons. Hard times right now! Glad we have each other -- reading blogs like yours boosts my spirits. Simply plated, classy and as always, a delicious offering. I've been on a citrus bender for quite a while now. 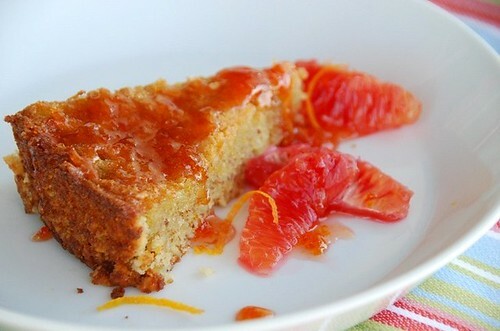 I adore blood oranges, that torte looks brilliant! What a yummy sounding torte! I don't get any blood oranges here but I do have sunny weather in spades...I am melting on this side of the word! If I could send some sunshine over to you for a little bit of cold to cool my head I would! LOve you Almond Torte & I adore your orange compote. I can imagine how wonderful & refreshing it's gonna taste! Btw thx for visiting, and remembering me sweetie. This sounds divine. I can't think of a better late winter pick-me-up. The citrus, almonds, honey and spice are light and spring-like with the promise of far away places. It wouldn't be a festa without you Susan! Thanks for joining us once again! heather-Oh, good! I'm happy to hear it. helene-I'm sure it is; it can be devastating for some people. meeta-Just my kind of jazz. happycook-Great! I hope you enjoy it! sunita-:) Let's hope March gets better. gffg-I'm so glad to hear that it can be tweaked for gf eaters. Thanks for the kind words. I appreciate it. leslie-Thanks a bunch! Yeah, ours are grown locally, so they are beautiful. mike-Glad to be of assistance! joey-They would be a good swap, indeed! debra-I love Cara Cara oranges and have blogged on them. soma-It's really light and lovely. maryann-I wouldn't have missed it for anything! susan-That's what I want to hear! Great combination of flavors, Susan. See you at the Festa! What a beautiful recipe, Susan. This torte would not only cheer those with the blues, but would add another spark to anyone's sunny disposition. I am certainly going to try it. Thanks for sharing! This looks so yummy! and the perfect dessert for spring! I can't wait to try it. All of the fun endorphins this is sure to release could cure anybody's affliction. Yay!!! I'm so glad you could join us Susan, and your dish looks dynamic!! I love blood oranges!! As always, this looks amazingly delicious! I'm definitely craving sunshine and I'm bookmarking this recipe! Oh my Susan. You've got my heart pounding:spicy compote of tart blood oranges soaked in honey, vanilla, cloves, and star anise - that's my kind-a-stuff!!! Mmmmmm!! I love how you did the blood orange compote. I bought a big bag of blood oranges at the Farmer's Market the other day and have been wondering what to do with them. You've got me thinkin'! Wow! That sounds delicious and looks like sunshine on a plate. Yum! Maybe I read the recipe too quickly, but can you clarify whether is is baking powder or soda in the recipe (ingred says powder, instr say soda) and also, do you add the ground almonds to the egg mixture or the flour mixture, or maybe it doesn't matter. The cake and compote look just delicious! Thanks! Seeing as it snowed yesterday in Seattle, this made me VERY happy. SO fresh and springy! I glad you are fighting "SAD" with an Italian dessert. It makes sense to me... Bravo! that looks almost too good to eat! I was feeling blue, but now I'm feeling for orange ;)! Can I have some,please? Have all in the house except for the Blood oranges (have Cara Cara which will work. A wee bit different but tasty) Sunday dessert. Mmmmm. And the weather is changing....slowly...but we have a spring day in MN. Thinking spring. barbara-That's awfully sweet of you to say. marie-I would never miss a festa! brilynn-It's make you feel sunny inside. tanna-It's delicious on so many different desserts and breakfasts. lori-It's so easy and delicous. marzipanmom-It's powder. You can add the almonds to the sifted flour mixture. Thanks for asking. I made the changes. claudia-Oh, sure, you could use Cara-Caras. I love them too. annette-Oh, wonderful! Thanks for letting me know. I love the compote on yogurt and granola too. i could stare at that top picture for hours. i feel if i do, summer will come a bit more quickly? I love a good almondy dessert, I especially like the fresh ingredients in this one :). Lovely and delicious looking! Wow... I don't know which is better, the thought of actually tasting this or the colors involved. So intense and bright. Oh, this is so beautiful! I realyl wish blood oranges were more easily available here in the UK... They are a rare treat, or an expensive specialist item, despite growing just across the Channel. Harumph. We made this not once but twice (!) for various family Christmas celebrations. Couldn't have asked for a better recipe, just a perfect dessert. Thank you!